Four very different albums by the great singer-songwriter reveal her many strengths and inconsistencies. With hindsight and the gradual reissue of her catalogue, it seems clearer that Jackie DeShannon was among the preeminent American singer-songwriters of the '60s, comparable in some ways to the greatest British singer of the period, Dusty Springfield. The generic sweep of DeShannon's music is at least the equal of Springfield's, and she was a songwriter to boot. But unlike Springfield, DeShannon's versatility led to an inconsistency which may have crippled her commercial prospects. Although she scored two big hits as a singer ("What the World Needs Now Is Love" and "Put a Little Love In Your Heart") and wrote countless hits for others (notably "When You Walk In the Room", a hit for the Searchers, who also covered “Needles and Pins” after hearing her version), her other records are considerably less well-known, and she never made an album of the magnitude of Dusty In Memphis. Despite consistent critical acclaim and regular opportunities to make records, she would never see the upper reaches of the charts again. Indeed, the general audience probably knows DeShannon less for her '60s heyday than for her authorship of "Bette Davis Eyes”, Kim Carnes' monster hit from 1981. Although she's had several compilations released by EMI, Rhino, Raven, and others, was featured twice on Rhino's girl-group box set One Kiss Can Lead to Another, and has a volume in Ace's ongoing songwriters series, the reissue of DeShannon's proper albums has been piecemeal, drawn out over a number of years and a variety of labels. Collectors' Choice recently picked up some of the remaining slack: her self-titled Liberty debut from 1963, a twofer combining 1968's Me About You and 1970's To Be Free, and her 1975 Columbia release, New Arrangement, which includes "Bette Davis Eyes". At least a half dozen albums popped up between Jackie DeShannon and Me About You, a somewhat ballad-heavy outing that gets better in its second half. Running through 13 songs in barely 30 minutes, Me About You is hit-or-miss, largely due to the nondescript and very short songs, particularly the ballads, which in most cases just don't have enough time to build or make much of an impression. That the album wraps up with a fantastic version of the Four Tops' "I'll Turn to Stone" seems less surprising on paper than during the actual listening experience, when, following Van Dyke Parks' melodically and metrically sophisticated "High Coin", it socks you with the highest voltage of soul on the whole album. That much-welcome burst of energy serves as a nice warmup for To Be Free, which followed Me About You by two years and is an altogether better album. It's more raw from the get-go, even if the opener, "Livin' On the Easy Side", is little more than a roll call of the anthropomorphized animals that appear in the album artwork. To Be Free is also more of a showcase for DeShannon's own compositions, which in this case lean towards light soul and, in the case of “Brighton Hill”, something approximating the style of a sitcom theme song. The best of the covers, again drawing partly from Motown, is a medley of “You Keep Me Hangin' On” and “Hurt So Bad”, which is more convincing as soul music than anything else here, due to DeShannon's gritty vocal. While To Be Free is a consistent album, and far less bewildering than Me About You, it also turned out to be DeShannon's last for Imperial. She would spend the next few years recording for Capitol and Atlantic, with artistic and critical success but zero chart action. All of which brings us to New Arrangement, DeShannon's 1975 one-off for Columbia. It's hard to approach this album without focusing on the presence of "Bette Davis Eyes", which, issued forth from the tortured larynx of Kim Carnes, became one of the defining new-wave records. Carnes' version was a pretty radical reinvention of the song, though, as DeShannon's goes for an old-timey feel, particularly with the piano. It's a fine reading, and certainly a standout, but New Arrangement as a whole is also superior to any of these other reissues. All of these songs are DeShannon originals but one, which gives the album a unity that the more haphazard earlier albums were lacking. This oneness is also supported by the production, which is '70s LA-contemporary without being overly glossy, sort of a lower-profile take on Joni Mitchell's Court and Spark. DeShannon tries a little of everything here -- country on “Queen of the Rodeo”, horn-driven pop on “Over My Head Again”, tender balladry on the closer “Dreamin' As One” -- tweaking the sound just enough to give each track its own color without sacrificing the continuity of the whole. Bolstered by five extra tracks, this reissue reveals New Arrangement as a small gem and one of DeShannon's finest efforts. But again, there was no commercial payoff, and it would be her last major-label album. If Jackie DeShannon had done nothing but record (“Needles and Pins”, “What the World Needs Now Is Love”) and write (“When You Walk In the Room”, “Bette Davis Eyes”) a few isolated hits, she'd warrant at least a footnote in the annals of rock history. That she recorded upwards of a dozen albums and wrote a slew of oft-covered songs doesn't seem to have earned her much more recognition as a recording artist. 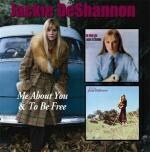 These reissues probably won't change that fact -- and the music doesn't always warrant it -- but by filling in some of the gaps in her digital catalogue, they allow us to get a better sense of Jackie DeShannon's career trajectory. When the artist in question was one of the foremost songwriters of rock and roll's heyday, a little revelation can never be a bad thing.